The Mexican market around the corner from my house, which I previously mentioned in my last post, always has great prices on produce. Sometimes though, I get tricked by the great prices and overlook the not-so-awesome quality of the product. I bought a bunch of strawberries that weren't all that hot, so I made some delicious strawberry-lychee aguas frescas instead. Problem solved. Another great price flashed before me and then I found myself buying a huge bag full of zucchini. I love zucchini and I practically got a whole bag full for free - that's how awesomely cheap it was. This time though, the prices weren't a cover for the quality. Awesome, awesome zucchini - now what to do with it? Zucchini fries! I had everything on hand and I felt like a snack. After trimming, slicing, dredging, and tossing into a hot oven to crisp up I was rewarded with a healthy, nom-worthy snack within all but 15 minutes. It was awesome. Normally, telling you that I ate the whole batch within one sitting would make me a bit shameful, but heck... I'll admit eating 3 zucchini within a sitting any day. I'm sure I made mothers and nutritionists proud everywhere around the world! Preheat the oven to 425 F. In a medium pot, heat the olive oil over medium heat. Add the garlic and saute until golden, being careful not to burn it. Add the crushed tomatoes, salt, pepper, oregano, basil and bay leaf. Stir and reduce the heat to low. Cover and let simmer about 20 minutes. In a small bowl, beat the egg whites and season with salt and pepper. 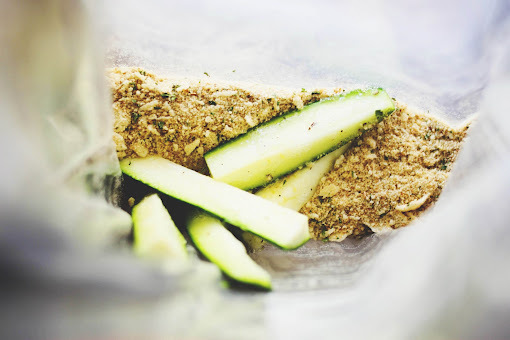 In a ziplock bag, place the breadcrumbs, garlic powder and cheese; shake well. Spray a cookie sheet with cooking spray and set aside. 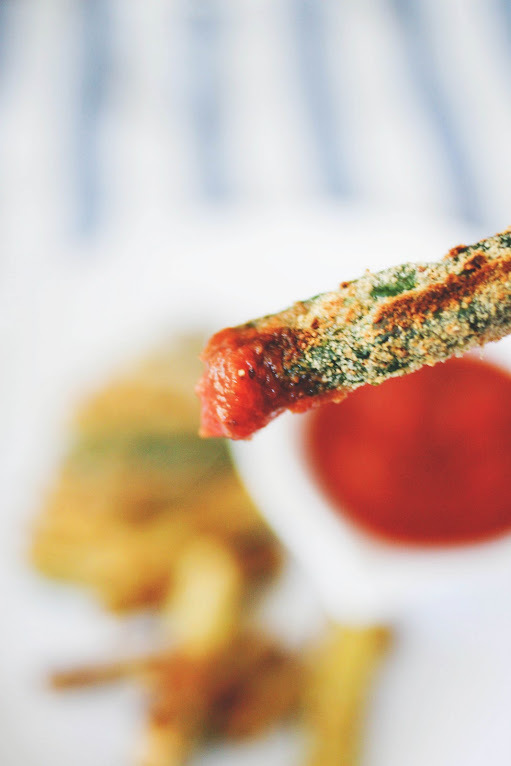 Dip the zucchini sticks into the egg and then place into the bread crumb and cheese mixture, a few at a time and shake to coat. 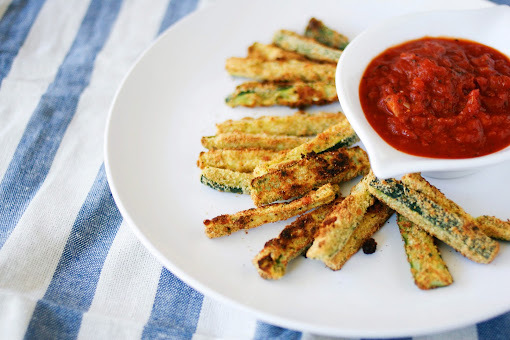 Place the breaded zucchini in a single layer and spray more cooking spray on top. Bake for 20 - 25 minutes, or until golden brown. 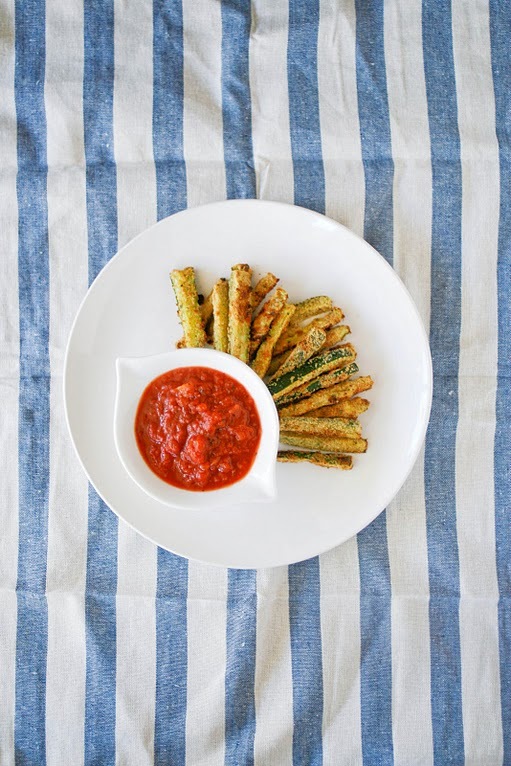 Serve with some marinara sauce for dipping. I've been reading your blog for about a year now but I've never commented. I just need to say that I LOVE it and I get so excited when I see a new post. oo these look lovely! & healthy too, bonus! any recommendations for brands of breadcrumbs? maybe i'm being a bit OCD.. These fries look awesome! I can't wait to pick up some zucchini for this! These look fantastic and healthy, too. Lovely idea! these pictures make the dish even more delicious!!! i love that these are baked! i am definitely going to have to try this! I recently made something similar with parmesan cheese and cut them like chips and not fries. I bet they are good! I love zucchini sticks, and these are such a healthy alternative! I can't wait to start dipping! I'm already in love with your photos (have I said that before.) This! Right up my alley these day. YUM. These look amazing. Love your blog and I just became your newest follower. you're the bomb. they look amazing. Just made these tonight. They were a great hit! Thanks for the recipe!